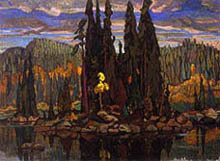 Arthur Lismer, Isles of Spruce, 1922. Oil on canvas. Canadian Painters as Art Educators: 1920 – 1950 was an exhibition of work by the Group of Seven and their contemporaries drawn from the Hart House permanent collection that contemplated the role of art education in the growth of Canadian appreciation for the visual arts. Featured artists: J.W. Beatty, André Biéler, Fritz Brandtner, Bertram Brooker, Franklin Carmichael, Emily Carr, Charles Comfort, Grace E. Coombs, Barker Fairley, L. L. Fitzgerald, Lawren Harris, Edwin Holgate, Yvonne McKague Housser, A.Y. Jackson, Arthur Lismer, John Goodwin Lyman, J.E.H. MacDonald, J.W.G., Macdonald, Lilias Torrance Newton, Alfred Pellan, George D. Pepper, Anne Douglas Savage, Carl Schaefer, and Frederick H. Varley.